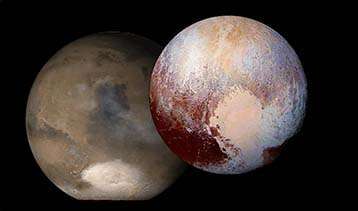 Pluto similar to Mars: even though the mechanism of atmospheric condensation in the low altitude regions has no equivalent on Earth, it is already known on Mars (left), where the CO2 atmosphere can condense at the surface, like nitrogen on Pluto (right, false color, with the prominent nitrogen glacier at the bottom of Sputnik Planum at the center of the image). During the Martian winter and spring, dry ice preferentially covers the bottom of Hellas crater (at the bottom of the picture of Mars), which, like Sputnik Planum, lies several thousand meters below the level of the neighboring areas that remain free of ice. Credit: © Laboratoire météorologie dynamique (CNRS/École polytechnique/UPMC/ENS Paris); NASA/JPL/MSSS; NASA/Johns Hopkins University Applied Physics Laboratory/Southwest Research Institute. What is the origin of the large heart-shaped nitrogen glacier revealed in 2015 on Pluto by the New Horizons spacecraft? Two researchers from the Laboratoire de météorologie dynamique (CNRS/École polytechnique/UPMC/ENS Paris) show that Pluto's peculiar insolation and atmosphere favor nitrogen condensation near the equator, in the lower altitude regions, leading to an accumulation of ice at the bottom of Sputnik Planum, a vast topographic basin. Through their simulations, they also explain the surface distribution and atmospheric abundance of other types of volatiles observed on Pluto. These results are published in Nature on September 19, 2016. Pluto is a paradise for glaciologists. Among the types of ice covering its surface, nitrogen is the most volatile: when it sublimes (at -235 °C), it forms a thin atmosphere in equilibrium with the ice reservoir at the surface. One of the most unexpected observations from New Horizons, which flew by Pluto in July 2015, showed that this reservoir of solid nitrogen is extremely massive, and mostly contained in "Sputnik Planum", a topographic basin located within the tropics of Pluto. Methane frost also appears all over the northern hemisphere, except at the equator, while carbon monoxide ice in smaller amounts was only detected in Sputnik Planum. Until now, the distribution of Pluto's ice remained unexplained. To better understand the physical processes at work on Pluto, the researchers developed a numerical thermal model of the surface of the dwarf planet able to simulate the nitrogen, methane and carbon monoxide cycles over thousands of years, and compared the results with the observations made by the New Horizons spacecraft. Their model shows that the solid-gas equilibrium of nitrogen is responsible for trapping the ice in Sputnik Planum. At the bottom of the basin, the pressure of the atmosphere - and therefore of gaseous nitrogen - increases, and the corresponding frost temperature is higher than outside the basin, which allows the nitrogen to preferably condense into ice. Simulations show that the nitrogen ice inevitably accumulates in the basin, thus forming a permanent nitrogen reservoir, as observed by New Horizons. Pluto as observed by New Horizons in July 2015 (left), compared to the model result to date (right). Credit: © Laboratoire de météorologie dynamique (CNRS/École polytechnique/UPMC/ENS Paris) / NASA/Johns Hopkins University Applied Physics Laboratory/Southwest Research Institute. The numerical simulations also describe the methane and carbon monoxide cycles. Because of its volatility similar to that of nitrogen, carbon monoxide ice is entirely sequestered with nitrogen in the basin, in keeping with the New Horizons measurements. 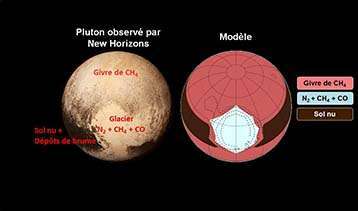 Regarding the methane ice, its lower volatility at the temperatures prevailing on Pluto allows it to exist elsewhere than in the Sputnik Planum glacier. The model shows that pure methane ice seasonally covers both hemispheres, in agreement with New Horizons data. This scenario shows that there is no need for an internal reservoir of nitrogen ice to explain the formation of the Sputnik Planum glacier, as suggested by previous studies. Instead, well-known physical principles underlie this icy cocktail on Pluto and its spectacular activity, one of the most fascinating in the Solar System. The researchers also predict that atmospheric pressure is at its seasonal peak and will decrease in the next decades, while seasonal frosts will tend to disappear. Working without a soul, as in ancient times (the Bible). Efficient machine (binary system) and the amplitude of the temperature (perihelion-aphelion) and the magic limit of nitrogen (Melting point 63.15 K (-210.00 ° C)) together make up a laboratory for the creation of a dynamic body. Pluto clearly shows how does the process of of construction of complex elements (from H2 (basic and most abundant element in the universe), and in which order and ratios (at these temperatures space). Here we see the really creation of the Universe and ascending, processes.